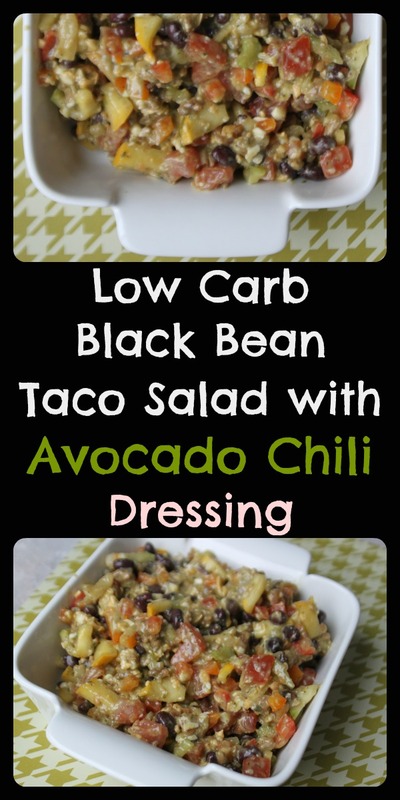 MamaEatsClean: Taco Explosion - Low-Carb Corn Free Black Bean Taco Salad with Avocado Cilantro Green Chili Dressing! Ole! Taco Explosion - Low-Carb Corn Free Black Bean Taco Salad with Avocado Cilantro Green Chili Dressing! Ole! Woo, hoo. A surprisingly delicious salad that is super low carb and full of clean and Candida diet friendly ingredients. I was heading to a potluck barbecue this weekend and needed to bring something that I could eat. Something that would have sufficient protein to fill me up in case I couldn't find any other Candida diet friendly foods to eat (which I did but you never know). And I was hoping it would taste delicious - given I'm a food blogger and all. I didn't want it to taste like a desperate attempt to make a sugar, grain, yeast, starch, corn & vinegar-free taco salad. Sometimes my experiments can be a bit "off". Didn't want to have an off night in front of my hubbies colleague. Colleagues I was meeting for the first time. But this one seemed to be a hit. I got one "it tastes like a taco exploded in my mouth". Need I say more. The base of the salad is zucchini. Super low calorie and low carb. And black beans, that are well rinsed and drained, are relatively low carb and legal. And if you love Cilantro and Avocado then you will love this dressing. And sorry to Cathy about the red wine on the carpet and to Michelle for the red wine on her previously awesome yellow shirt. Damn baby...........I don't even get to drink these days and I'm still causing spills everywhere I go. Wash and chop your vegetables and put them aside. Heat the oil in a frying pan over medium heat. Add minced garlic. Fry for 1 minute before adding ground beef. Fry beef until browned and cooked through. In a separate bowl, combine spices: onion, red pepper, oregano, paprika, cumin, salt, pepper and chili. Add spices to browned beef and continue cooking for an additional 5 to 10 minutes until most of the juice has evaporated. If your beef is really dry you might want to add 1 - 2 Tbsp of water just before adding the spices. Let beef cool completely before layering your salad. While the beef is frying make your dressing. I just put all the ingredients in my magic bullet and pulsed until it was fully combined. Chill in fridge before serving. I layered my salad with veggies, beef and then cheese. Just prior to serving I added the dressing and mixed the salad thoroughly. Enjoy! We also ate this the next day after it had been sitting with the dressing over night and it was still delicious and held up well.